Toward the end of the third century, Chariton of Iconium (in Asia Minor) was tortured at the hands of the emperor Aurelian for being a Christian. After his release, Chariton pledged to go on pilgrimage to Jerusalem as a way of thanking God for his survival. But as he was approaching the Holy City, bandits attacked him, robbed him of his possessions, and took him to a cave in the Judean desert. When his captors died, he decided to settle permanently in the Holy Land and established a monastic community near Jericho. In the fifth century, Mary, a harlot from Alexandria, Egypt, traveled with some pilgrims on their way to Jerusalem “in the hope of seducing them.” Out of curiosity, she followed them into the church of the Holy Sepulchre, where she was miraculously barred from entering. Her repentance provided the necessary key for entering the magnificent basilica—she was, in a sense, baptized by her own tears. After leaving the church, Mary withdrew to the nearby Judean desert. Jerusalem and its surrounding lands have always been a unique and powerful place for religious transformation. Pilgrims traveled to Palestine in order to see and honor the places where Jesus Christ lived, taught, and died. But for some pilgrims, like Chariton and Mary, the experience led to a lifelong commitment to poverty, prayer, and self-renunciation. The monastics who chose to stay in the Holy Land became objects of pilgrimage themselves. 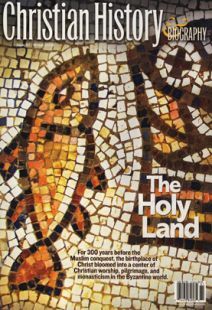 Later pilgrims traveling through Palestine during the Byzantine era came not only to honor the holy sites; they also sought the advice of “holy” men and women who had settled in the region. For such pilgrims, the monastic Christians living in the Holy Land represented a tangible link to the disciples of the apostolic church. These monastics clearly recognized their debt to those who first inhabited this hallowed ground: the prophets of old who had professed the Messiah with their teaching, and the martyrs of more recent times who confessed Christ with their blood. The monks and nuns of Palestine saw themselves as protectors of a legacy—geographical, theological, and spiritual—that originated in the Old Testament, persisted through the New Testament, and survived in their own time. They were preserving, even promoting, a centuries-old heritage. In this land, so they were convinced, God once walked. The desert was not barren; in this land, God still lived. Monasticism was "in the air" in the fourth and fifth centuries. Antony gave up his possessions to live a solitary life of prayer in the Egyptian desert, inspiring thousands. Pachomius brought monks together into a new kind of communal life. Cassian took Eastern monastic ideals to the West, where Benedict of Nursia created his own model of Christian community. Palestine played an important role in this monastic explosion. Biblical precedents and personalities— Elijah, Elisha, John the Baptist, and Jesus himself— attracted faithful visitors and aspiring monastics. The austere cliffs and caves of the Judean desert stretching east of Jerusalem to the Dead Sea presented a double advantage: remoteness and accessibility. You could walk just an hour from the Holy City and find yourself in the wilderness. No one is sure who first sought out this spiritual refuge. The historian Eusebius records that, toward the middle of the third century, a bishop of Jerusalem named Narcissus fled to the desert in order to avoid scandalous rumors. Others sought to escape persecution or barbarian invasions. Chariton is often considered the pioneer of monasticism in the wilderness immediately outside Jerusalem. Others chose to remain in or near the holy sites themselves: the renowned Roman matron Melania the Elder and her companion Rufinus founded monastic communities on the Mount of Olives, while the scholar Jerome and his aristocratic friend Paula did the same near the Church of the Nativity in Bethlehem. These were frequented by intellectuals such as Evagrius and Cassian. Monks flocked to Palestine from nearby Egypt and Syria and also from far-away Rome and Gaul. By the early fourth century, the diversity of pious pilgrims and monastic luminaries gave Palestinian monasticism its own unique aristocratic, international, and ecumenical character. One monastic luminary in the fifth century was Euthymius (376-473), a monk from Armenia. Euthymius settled first in Chariton's monastery, then wandered in the remote desert nearer to the Dead Sea. There, he converted and baptized an entire tribe of Arab Bedouins after healing the leader's son. The leader, renamed Peter, became the first Arab bishop in Palestine. Euthymius's lifestyle attracted hundreds of others to follow his example, including Sabas from Cappadocia in Asia Minor, who became an important monastic leader and builder of monasteries. (Their lives were chronicled in the sixth century by Cyril of Scythopolis, the first Palestinian Christian historian). Euthymius and Sabas primarily sought solitude and silence in the stillness of a cave. But as their reputation grew, other disciples and visitors from Jerusalem gathered around them, for whom they felt increasingly responsible. So they organized communities for those who approached them for spiritual direction. Palestinian monasticism was unusually flexible. Monastics were free to move through the three stages and distinct lifestyles of early monasticism, graduating from life in community (the cenobitic way) to small groups (in scetes) and even complete solitude in the desert (as hermits). The monks forged new ways of living both in solitude and in community—dwelling alone in cells or caves during the week but coming to a central area for worship and other communal business on Saturdays and Sundays. During the 40 days of Lent, monks went out in pairs to the desert, where they led an austere and regimented ascetic life in complete solitude. On the eve of Palm Sunday, they returned to the central community for Holy Week and celebrated Easter either in their monastery church or in the church of the Holy Sepulchre in Jerusalem. Monastic communities sprang up not only in the Judean desert but also in Galilee and especially in the area around Gaza to the southwest. According to Jerome, the founder of monasticism there was Hilarion (291-373), a native of Palestine who had been inspired by Antony of Egypt. John Chryssavgis has taught in Boston and in Sydney, Australia, and is the author of numerous books and articles on Orthodox theology and spirituality.